A serious, full-bodied, exuberant, flamboyant, exotic dry white. 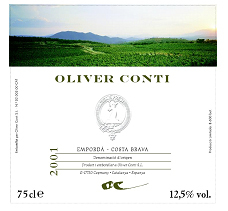 Conti´s 2001 Blanco (80% Gewurztraminer and 20% Sauvignon) is loaded with personality and character. A huge honeysuckle, Asian spice and incense-scented bouquet is followed by a wine with an amazing texture and a dry full-bodied finish. This big, bold effort, which contrasts with all the deliciously light, fresh, stainless steel Spanish whites, can be drunk over the next several years.